Aspray, W., F. Mayadas and M.Y. Vardi (eds). 2006. Globalization and offshoring of software. A report of the ACM Job Migration Task Force. New York: ACM. http://www.acm.org/globalizationreport/overview.pdf. Accessed 27 July 2015. Cassidy, M. Hour of code builds a deeper understanding of the power of computing. San Jose Mercury News, (10 December 2013). http://www.mercurynews.com/mike-cassidy/ci_24712130/cassidy-sode-org-hour-code-builds-deeper-understanding. Accessed 20 Dec 2014. Code.org, Code.org partners with ACM, Grows team. (31 July 2013). https://code.org/news/teamgrowth. Accessed 23 May 2015. Computer Science Teachers Association. 2015. A brief history of the K-12 CS education movement. Google document. https://docs.google.com/document/d/1rdEUqAkYtKPMD4UeEmpZCAau4_AdIOGbZDqLkePAQrY/edit?pli=1#. Accessed 8 Sept 2015. Empson, R. 2013a. Obama, celebrities, politicians and tech Co’s come together to launch coding educators push. TechCrunch, (8 December 2013a). http://techcrunch.com/2013/12/08/obamacelebrities-politicians-and-tech-cos-cometogether-to-launch-computer-science-educationpush/. Accessed 20 Dec 2014. Empson, R. 2013b. Code.org: 2 weeks and 600 M+ lines of code later, 20 M students have learned an ‘Hour of Code’. TechCrunch (26 December 2013b). http://techcrunch.com/2013/12/26/codeorg-2-weeks-and-600m-lines-of-code-later-20m-students-have-leared-an-hour-of-code/. Accessed 20 Dec 2014. Ericson, B., M. Armoni, J. Gal-Ezer, D. Seehorn, C. Stephenson, and F. Trees. 2015. 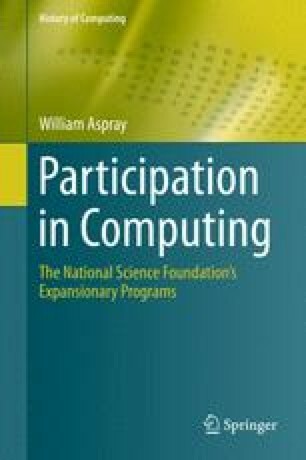 Ensuring exemplary teaching in an essential discipline: Addressing the crisis in computer science teacher Certification. Teacher Certification Task Force. New York: Computer Science Teacher Association (September 2008), http://www.csta.acm.org/Communications/sub/DocsPresentationFiles/CertificationFinal.pdf. Accessed 2 June 2015. Fay, L.B. 2010. Analyzing equitable education in Jane Margolis’ stuck in the shallow end. Digital Is (30 August 2010). http://digitalis.nwp.org/resource/727. Accessed 26 May 2015. Gannes, L. 2013a. Hack attack! Mark Zuckerberg and Bill Gates teach “Hour of Code” online computer science class. AllThingsD, (14 October 2013a). http://allthingsd.com/20131014/hack-attackmark-zuckerberg-and-bill-gates-teach-hour-of-code-online-computer-science-class/. Accessed 20 Dec 2014. Gannes, L. 2013b. 15 million students learned to program this week, Thanks to hour of code. AllThingsD (13 December 2013b). http://allthingsd.com/20131213/15-million-students-learned-to--program-this-week-thanks-to-hour-of-code/. Accessed 20 Dec 2014. Glaeser, E.L. 2013. An ‘Hour of Code’ isn’t enough. Boston Globe (12 December 2013). http://bostonglobe.com/opinion/editorials/2013/12/12/hour-code-highlights-need-for-better-computereducation/9aedOXrgRXE5MravhkUKfK/story.html. Accessed 20 Dec 2014. Harmon, J. 2013. Jane Margolis: Bringing all students into the loop of computer science knowledge. Ampersand, 7 January. http://ampersand.gseis.ucla.edu/jane-margolis-bringing-allstudents-into-the-loop-of-computer-science-knowledge/. Accessed 27 Oct 2015. Lang, K., R. Galanos, J. Goode, D. Seehorn, F. Trees, P. Phillips, and C. Stephenson. 2013. Bugs in the system: Computer science teacher certification in the U.S. Computer Science Teachers Association. New York: ACM. http://csta.acm.org/ComputerScienceTeacherCertification/sub/CSTA_BugsInTheSystem.pdf. Accessed 2 June 2015. Mabry, B. 2010. Education’s most startling paradox: K-12 computer science education declines. http://www.acm.org/press-room/news-releases/2010/education-paradox/. Accessed 23 May 2015. Margolis, J. 2014. Into the loop alliance website. http://idea.gseis.ucla.edu/projects/into-the-loop. Accessed 20 Dec 2014. Morrison, N. 2013. Teach kids how to code and you give them a skill for life. Forbes, 27 December. http://www.forbes.com/sites/nickmorrison/2013/12/27/teach-kids-how-to-code-andyou-give-them-a-skill-for-life/. Accessed 20 Dec 2014. Nieva, R. 2013. Code.org has launched a meaningful attempt at education reform. Let’s hope the starpower helps. http://pando.com/2013/02/26/code-org-has-launched-a-meaningfulattempt-at-education-reform-lets-hope-the-star-power-helps/. Accessed 20 Dec 2014. Partovi, H. Code.org pursues action on getting computer science into schools. Computing Research News 25(10). http://cra.org/crn/2013/11/code-org_pursues_action_on_getting_computer_science_into_schools/. Accessed 27 Oct 2015. Stephenson, C., J. Gal-Ezer, B. Haberman, and A. Verno. 2005. The new educational imperative: Improving high school computer science education. Curriculum Improvement Task Force. New York: Computer Science Teachers Association. http://csta.acm.org/Communications/sub/DocsPresentationFiles/White_Paper07_06.pdf. Accessed 2 June 2015. Suba, R. 2014. Code.org cashes in on Flappy Bird craze: Code your own flappy game. Tech Times, 2 March. http://www.techtimes.com/articles/3874/20140302/code-org-cashes-in-on--flappy-bird-craze-code-your-own-flappy-game.htm. Accessed 20 Dec 2014. Taylor, C., Watch Zuck, Bill Gates, and Jack Dorsey & others in short film to inspire kids to learn how to code. 2013. TechCrucnch, 26 February. http://techcrunch.com/2013/02/26/zuck-bill-jackdorsey-code-org-film/. Accessed 20 Dec 2014. Taylor, C. 2013. How Code.org’s ‘Learn to Code’ video Starring Zuck and Gates surpassed 12M views in 2 weeks. TechCrunch, 13 March. http://techcrunch.com/2013/03/13/how-code-orgslearn-to-code-video-starring-zuck-and-gates-surpassed-12m-views-in-2-weeks/. Accessed 20 Dec 2014.